A statue of Mahatma Gandhi will be removed from a university campus in Ghana after professors launched a petition claiming the revered Indian independence leader and thinker was racist. 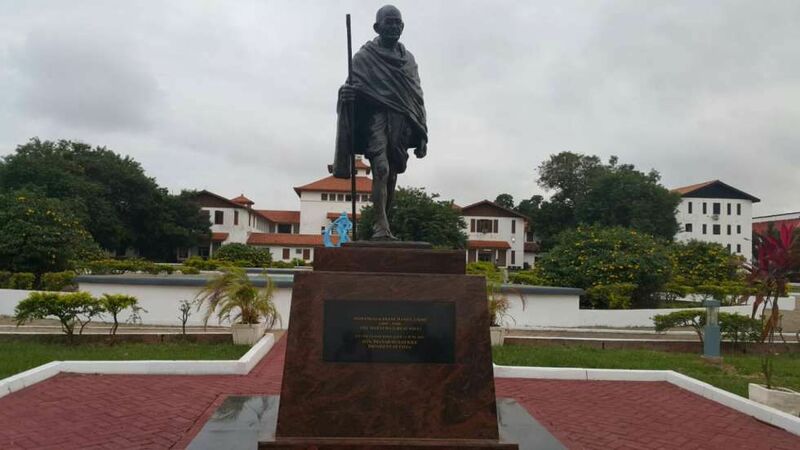 The statue of Gandhi was unveiled in June at the University of Ghana campus in Accra by Pranab Mukherjee, the president of India, as a symbol of close ties between the two countries. But in September a group of professors started a petition calling for the removal of the statue, saying Gandhi was racist and that the university should put African heroes and heroines “first and foremost”. Statues on university campuses have recently prompted bitter arguments in Africa as students wrestle with the legacy of colonialism and history of racism on the continent. Last year students in South Africa successfully campaigned for the removal, from the University of Cape Town campus, of a statue of Cecil Rhodes, a notoriously racist mining magnate who died in 1902. Gandhi, who lived in South Africa for 21 years, has long been a more controversial figure, both in his homeland and elsewhere, than many admirers around the world are aware. A hero for his role in the movement that won independence for India from Britain, Gandhi’s vision of non-violent protest inspired rebels and revolutionaries around the world. His thinking was a key influence on leaders of the African National Congress and others engaged in the struggle against apartheid, and his tolerance for all faiths in his homeland led to his assassination by a Hindu fanatic in 1948. But his more conservative views, and early apparent racism, still anger some. Opponents of the statue in Ghana quoted several of Gandhi’s early writings in which he referred to black South Africans as “kaffirs” – a highly offensive racist slur – and complained that the South African government wanted to “drag down” Indians to the same level as people he called “half-heathen natives”. A statue of Gandhi in the centre of Johannesburg not far from the office where he worked as a lawyer, triggered a similar row in 2003. Gandhi has also been frequently criticised in his homeland. In 2014 the novelist Arundhati Roy accused him of perpetuating a discriminatory caste system.